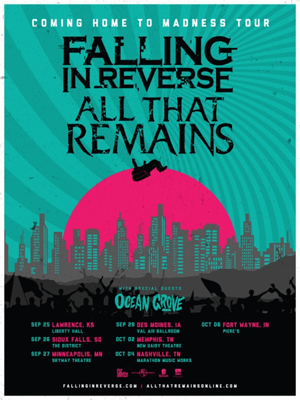 After a spate of summer tour dates that saw them appearing at festivals such as Chicago Open Air and Rise Above Fest, as well as a handful of "must see" special appearance at the Vans Warped Tour, where they are a perennial favorite, FALLING IN REVERSE have announced their Fall tour plans. The band will embark on "Coming Home to Madness", a co-headline tour with ALL THAT REMAINS. OCEAN GROVE will also appear. The first leg of dates kicks off on September 25 in Lawrence, Kansas and runs through October 6 in Fort Wayne, Indiana. FALLING IN REVERSE will also appear at multiple festivals this fall, including Self Help and Louder Than Life. The band is supporting its critically acclaimed new album Coming Home, released via Epitaph Records this past April. It was a massive sonic and artistic leap forward for FALLING IN REVERSE.